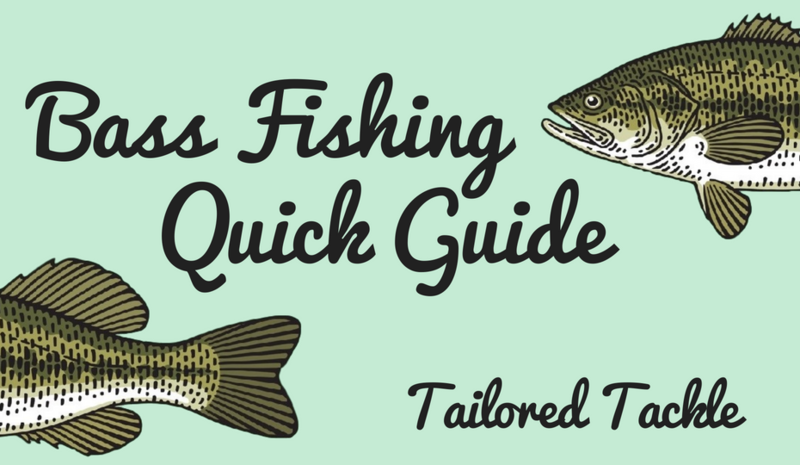 Learning how to fish for Bass can be overwhelming, so I break down the Bass fishing basics. Beginner Bass Fishing requires fundamental Bass lures and basic fishing gear so you have the essentials. Once you acquire the basic Bass tackle arsenal, you need to locate Bass and implement proven techniques to start catching fish. This game plan will teach you how to fish for Bass with a solid catch rate right from the start. If your fishing for the first time and Bass are your primary target, I highly recommend starting with a Spinning Rod & Reel Combo. You will be much more effective in targeting Bass with same tackle as a more advanced Baitcasting Rod & Reel combo. If you have experience fishing, and are now shifting your sites onto the Largemouth, it is a good investment to start your endeavors with a Baitcasting Rod and Reel combo. These take a lot of practice and patience, but when you get your licks in your accuracy, distance and efficiency will be improved over the Spinning set up. However, you can do virtually everything with either, and Baitcaster’s add another layer of frustration for the beginner so stick with a Spinning Combo until your ready to invest a good chunk of time. If your spooling up your Spinning Combo for first time I recommend starting out with 10 Lb. Monofilament. Mono is a readily available, affordable, and easy to use fishing line. For spooling up your Baitcaster for the first time, I recommend 20 Lb. Braided Line. You can tie braid straight onto your lures, but I would add a Fluorocarbon leader either tied to a swivel or directly to the line with a Double Uni knot. 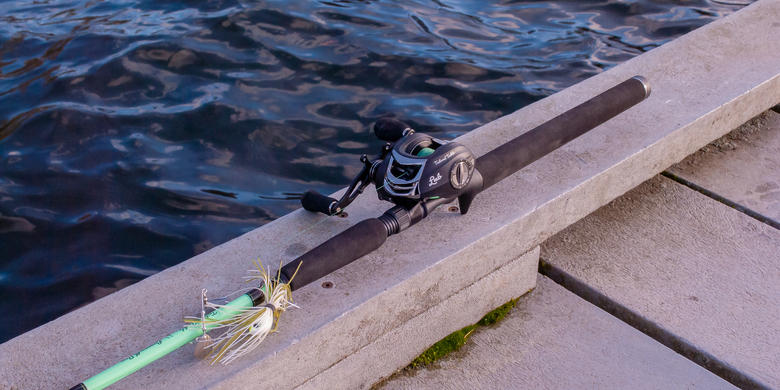 If you’re a more advanced angler, you would likely default to a full Flurocarbon (15-20 Lb.) main line. This is the optimal choice, however it requires advanced skill in drag systems, knot tying, and a bigger budget. Check out our post for the basics on fishing line selection: What Fishing Line Should I Use? When Bass are aggressive, biting reactively, or you are on the search, then a handful of hard baits is important for your arsenal. Crankbaits, Spinnerbaits, Weedless Jigs, Swimbaits, and Topwater lures are common staples to the bass fishing tackle box. In the beginning I would recommend 2 Crankbait types and one of each of the rest. 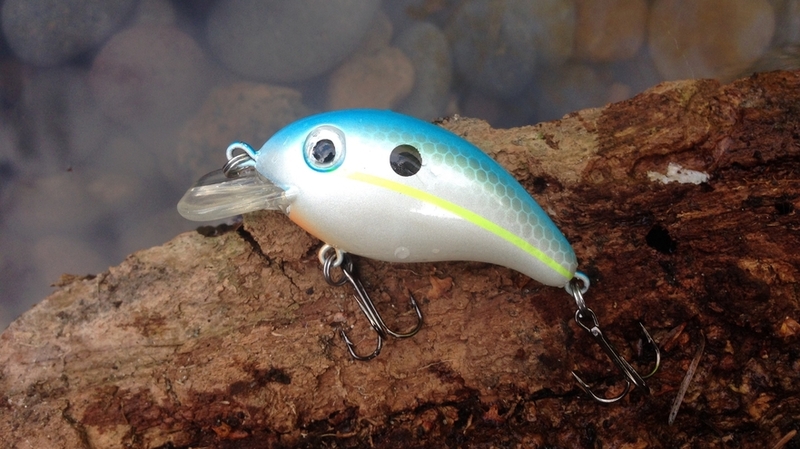 Having a Lipless Sinking Crankbait allows you to target deeper waters with deeper structure, while a Shallow Diving Square Bill Crankbait will cover most of the territory off the dock or in shallow neighborhood ponds. There are a bunch of Crankbait types in-between them for more specific scenarios, but you can generally cover most Crankbait opportunities by alternating between a Lipless and a Square Bill. A 5/8 Oz. Willow Blade Spinner Bait in White, Green or Chartreuse is a versatile pick to thump against cover and yoyo through grass. Use a 1/2 Oz. Skirted Jig to punch through debris and accurately flip into overhanging cover with the heavy lead head. I use a 4″ Swimbait in natural colors like White, Green, & Brown to paddle through Shad schools when present during active feeding hours (Morning/Evening). A 1/2 Oz. Topwater Frog is reserved for swampy situations in shallow water bodies where thick vegetation and Lily Pads are the only means for Bass to seek shade. Thump the frog downwards and pause around openings. If you get a hit, resist the temptation to set the hook. Let it it be for 2-3 more hits as Bass rarely take Topwater Frogs on the first bite. HatCamBass has a great video covering the basic Bass Fishing Lures every beginner should start with. Having a good mix of soft baits on hand is important when you are dialing in on a spot you know is holding Bass or the bite is lethargic and a slower approach brings home the bacon. Having a handful of soft plastic Bass lures by type is important for different situations. I recommend having a at least a single pack of each type: Worms (Stick Baits 5″, Tail Worms 7″ or Finesse Worms 6″) Curl Tail Grubs 3-4″, Shad Jerk Baits 4-5″, and Tube Baits 4″ (or Creature Baits). Generally default to natural colors like Green, Brown, Black when fishing shallower (< 10 Ft.) water with vegetation. Brighter, unnatural colors like Chartreuse, Bubblegum, and Blue are better for deeper, rocky structure. These are also effective in stained water. Silver and White is best for Baitfish imitation via Curl Tail Grubs and Jerk Shads. You’re going to need hooks, sinkers, jig heads, swivels, beads and something to store all the tackle in. Your go to hook should be an EWG Worm Hook 3/0 or 4/0 which will be paired with your soft plastic worms. To rig your worm wacky rig style you should have some 1/0 Octopus Hooks. I like to use lighter Round Bend Worm Hooks (#1-1/0) so the worm sinks slower and stays off the bottom longer when I am freelining the worm or using a Carolina Rig. 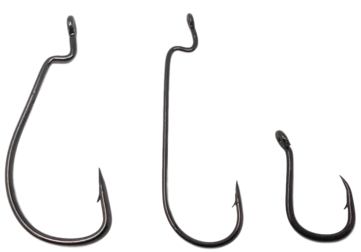 You need some sinkers to rig the worms in Carolina, Texas and Drop Shot Style. 1/4 -1/8 Oz. Worm Weights are staples for the Texas Rig. You can use these too for the Carolina Rig positioned above a 6mm Red Bead & #7 Barrel Swivel. We have a diagram in the quick guide to see how this looks. 1/4 – 1/8 Oz. Casting Sinkers should be used in tandem with the Drop Shot rig. I always keep some 1/4 Oz. + 1/8 Oz. Jig Heads to jig Tube Baits, pushing the eyelet of the jig through the head of tube covering the jig head. In colder temps when Bass are lethargic I pair a 3-4″ grub on these jigs to spoon feed a smaller profile. For starters I recommend storing your tackle in an 11″ x 7″ Stowaway Utility Box. These are easy to travel with and can fit in backpacks or carried by hand when walking ashore. As you progress you can buy a Soft Sided Tackle System that will hold your stowaways as you amass more Bass fishing tackle. A popular option for the weekend warrior is a Hard Sided Tackle Box. I find these less flexible because you can outgrow the space pretty quickly, and it doesn’t break down into smaller stowaways for portability. However Hard Siders have been a historic pick for many anglers. All the Bass Fishing Tackle discussed here is available in our Bass Fishing Kit. Now that we have the gear settled, the hardest part about Bass fishing is finding them. On average, the majority of Bass will be found in 10% of the lake. Not a general area that makes up 10%, but pockets of water spread out that amount to 10%. Finding a productive spot is where you start, but what will make you a great Bass angler is figuring out the combination of factors that make the spot successful and searching for duplicates. Finding the right relationship of depth, structure, cover, water temps and conditions will make you successful. When you get these right and land a few big Bass you want to duplicate the variables. Outside of peak feeding, Large Bass travel alone or in pods of 2-3, so after you get on a few big fish in a spot your catch rate will likely diminish. Note the characteristics and search for comparable locations to duplicate your previous success. 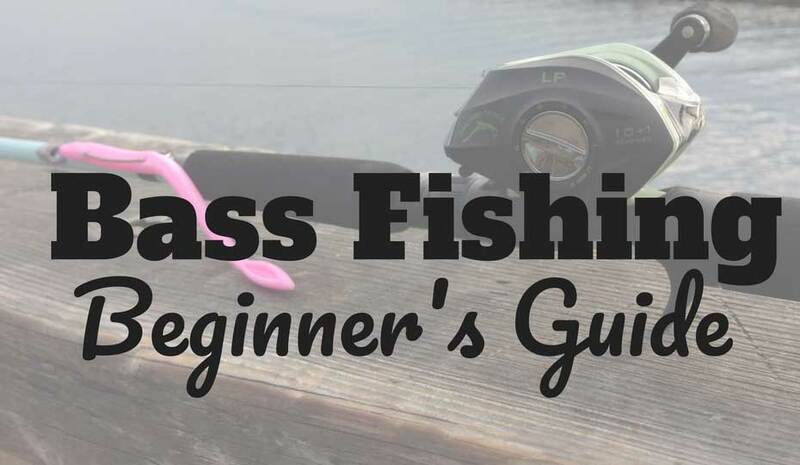 For more great tips on how to find bass, check out Bass Resource’s Tips for Beginners. Bass hold to it, particularly where transitions in structure occur. Changes in a body of water’s depth or bottom consistency are the general markers of structural change. Common structural features that support these changes are Creek Channels, Points, Humps, Holes, and Drop Offs. Bass use cover to find shade and ambush prey. Cover is made up of natural and man-made features that provide ideal characteristics for Bass to feed. Examples of Cover are Docks, Weedbeds, Boulders, Logs, Sunken Trees, Lili pads etc. Your goal is to position yourself near structure (where Bass are holding) and target areas that supply cover (where Bass are primed for striking). An example of this would be positioning yourself along a Drop-Off (Structure) and targeting a Dock (Cover) that hangs over the transition. Bass will often position themselves along the transitions of a Drop-Off, and the specific area where the Dock provides shade is an ideal position for a Bass to feed along that Drop-Off. The ideal temperature range Bass thrive in is 65-75 degrees. A week of rising temperatures, say 67 up to 73 degrees, typically rev-up Bass activity, while a week of declining temperatures, say 67 down to 61 degrees, will slow the Bass roll as they become more lethargic. A Bass’ body temperature is pegged to the water temps they inhabit. When it’s too cold (< 60) they conserve energy and their metabolism slows greatly. When its too hot (> 80) oxygen is often depleting and they’re focused on survival. You can’t control the weather but in most bodies of water I wouldn’t recommend Bass fishing when the water temperature is < 60 or > 80 degrees. Bass actively feed in the early mornings and late evening when light conditions are low and shallower forage is easier to access. Not only will the Bass be active, but they will be more predictable in terms of location. This is a great time for shore or dock anglers to take advantage of their position in the shallower areas. As the sun rises into later morning, Bass will either move deeper or hold out under cover like docks, overhanging branches, and swimming platforms. Midday, when light conditions are peaking they will undoubtedly be deeper if the body of water affords it. This would be a good time to target mid-lake structures like humps, holes, and creek channels. Once again, when the sun lowers Bass will move into the shallows. In Spring when water temps reach 65 degrees (South = March/April, North = May/June) Bass spawn in 3-5 Ft. of water within sheltered bays. 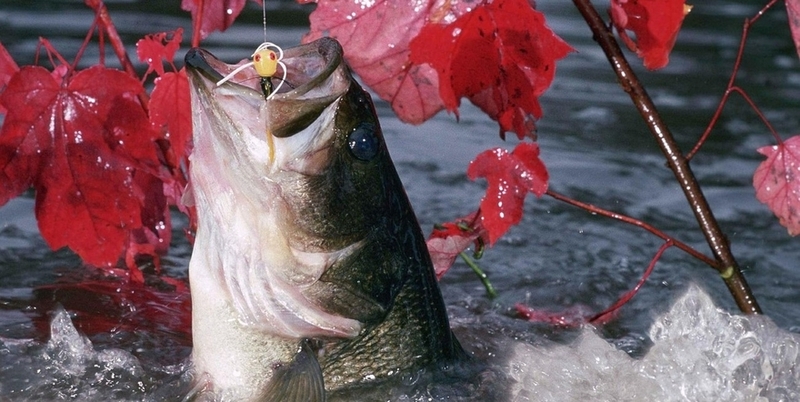 Bass in spawn are not actively feeding but both Male & Female can be provoked into bites. Spawn is a popular time of year to fish because Bass spawn in condensed areas of calm, shallow water forming easy to spot spawning beds. These are about 1 ft. diameter circles, cleared of debris so that the sand or gravel is exposed and easy to spot. Bass will hold tightly to their beds so re-targeting these small diameters will often provoke the smaller males to defend or even bother the larger females enough to take notice. We highly stress catch and release during this time and to be conscious of your disturbance to the spawning beds. If you can approach them at a distance by boat or better yet along shore you are less likely to disturb the beds and the roe. Fish off the bottom as Bass are rarely in shallow water outside of Spawn. Bounce your soft bait rigs or skirt jigs along the bottom, alternating between dragging steadily, lifting then dropping your bait with pause. Cast along the edge of structural transitions vs. across from them. Cast along the edge of cover like weedlines as well. Bass are not usually in the weeds but off to the side where the shade is cast. Let your bait cover the water column from the top edge of the weeds to the bottom, then primarily work your bait off the bottom on its way back. Target underwater cover like boulders, logs and stumps by rolling a snagless setup like a spinnerbait over and onto the sides of the cover. Make sure to really thump against the cover and let your lure role over, particularly to the shady side opposite the sun. Pitch your lures to target confined areas and overhanging cover. Let your line out the length of the pole and grab your lure (typically soft bait) with your opposite hand. Load up your rod tip by pulling the bait to your side. Aim at your secluded target and release the bait letting the rod sling your lure gently to the zone. Similar to Pitching but with trebled & heavy baits, flipping gets cranks and jigs into the tough to reach targets as well. Let out about 10-15 ft. of line to the side by pulling out line between your reel and the first rod guide. Pinch the line with your free hand before the first rod guide. Pendulum swing the bait towards the location releasing your pinched line at the end of the pendulum swing. This will flip your bait underneath the over hang as the excess line you set aside spools out. I love fishing.Real appreciable post. Phenomenal. Love this. Keep going.